Worldwide, mainstream aid projects tend to deal with the symptoms of problems, rather than the problems themselves. In fact, often aid projects actually exacerbate the root issue, by supply free food and clothing that undermines the ability of people on the ground to make a living. In other words, we put them out of their low carbon business, forcing them off the land into cities where they must become part of the consumer treadmill, or perish. But, sometimes, people with clear heads and unselfish hearts manage to help in much more substantial ways. 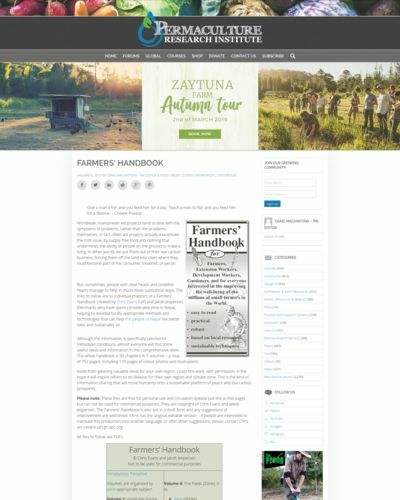 The links to follow are to individual chapters of a Farmers’ Handbook created by Chris Evans (UK) and Jakob Jespersen (Denmark), who have spent considerable time in Nepal, helping to develop locally appropriate methods and technologies that can help the people of Nepal live better lives, and sustainably so.